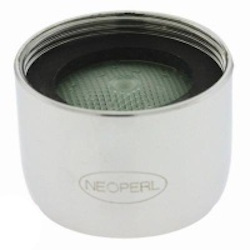 Neoperl Regular Female 1.5 gpm PCA Perlator - laminar stream with 55/64"-27 chrome finish. Economy flow pressure compensates female threads. Laminar provides consistent non-splashing and non-aerated stream. Dome filters prevent clogging and filters sediment and particles. Lime Resistant Honeycomb design replaces wire mesh screens.